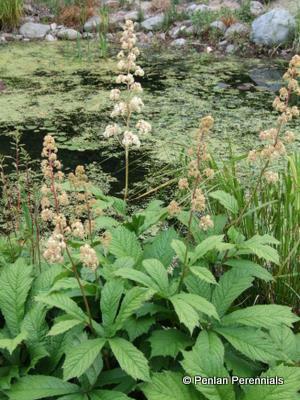 A lovely waterside plant with large glossy, dark green leaves on deep red stems. The leaves are sharply serrated and pinnate. This architectural plant produces branching panicles of petal-less, creamy-white flowers during summer. A plant that needs a constantly moist site during summer, it was introduced from Yunnan, China. Organically grown in peat free compost. A very easy plant to grow, being pest and disease resistant. Remove old foliage in spring and watch it go! Divide the rhizome in early spring or collect seed and sow fresh.